For decades, biologists and ecologists have largely characterized biological diversity using metrics based on entropy, a concept rooted in information theory that suggests one can quantify the degree of uncertainty associated with predicting bits and pieces of information. In ecology, this has boiled down to determining whether species drawn from a community are the same or different. The metrics will sound familiar to anyone who has taken an introductory ecology class–the Shannon index, Simpson diversity–but Lou Jost, Anne Chao, and others have highlighted the fact that the non-linearity of these indices may lead researchers to grossly misinterpret the underlying diversity of the community in question. Consequently, Lou Jost proposed in 2006 that diversity values be converted into equivalent or effective numbers of species (also known as Hill numbers), which is the number of equally abundant species necessary to produce the observed value of diversity (an analogue the concept of effective population size in genetics). Converting the entropic indices into effective numbers yield values of diversity that are intuitive and behave as we would expect–for instance, effective numbers obey the doubling property, which states that if two communities with X equally abundant but totally distinct species are combined, then the diversity of the combined community should be twice that of the original communities, or 2X. Moreover, they are in units of “number of species” and thus values of diversity are comparable across different metrics. Below is some R code from a recent lecture I gave on quantifying biological diversity. In it, I demonstrate the utility of the two most common metrics of diversity, Shannon and Simpson diversity, the utility of converting them into effective numbers, and show how to derive them from a more general equation for entropy (as well as using the same equation to generate so-called “diversity profiles”). The code uses simulated data so its entirely self contained (no downloads required!). First, consider the simplest case: a community with S species, all with equal abundances A. For community 1, S = 500 species, and A = 1 individual of each species. For community 2, S = first 250 species from community 1, and A = 1 individuals of each species. As we know (since we created the communities), the richness of community 2 is half that of community 1. Now let’s incorporate information on species abundances into our diversity index. We’ll begin with the commonly used Shannon index, which quantifies the uncertainty that any two species drawn from the community are different. Shannon diversity ranges from 0 (total certainty) to log(S) (total uncertainty). And now let’s ensure that community 1 has the maximum value of Shannon diversity, since it has the maximum number of species with equal numbers of individuals for each species. And now let’s test the same logical argument as before, asking whether Shannon diversity of community 2 is half that of community 1. Uh, ok. So that isn’t true. What the heck is going on here? Let’s do a little exploring. 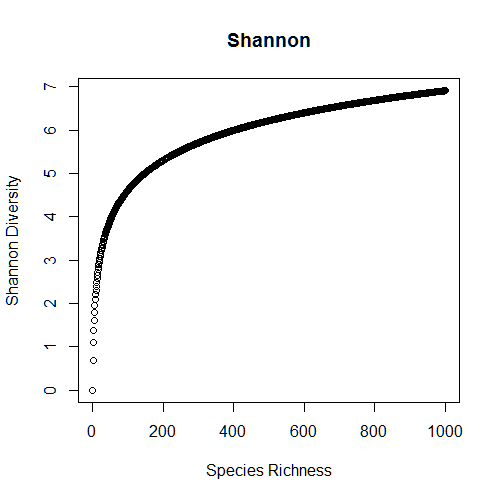 Let’s calculate Shannon diversity for all levels of species richness from S = 1 to 1000 (this will take a bit), and then plot the results. Ah-ha! Here is our answer. The relationship between species richness and Shannon diversity is non-linear: at higher levels of species richness, communities will appear more similar (in terms of the magnitude of the index) that at lower levels of species richness. This is exactly how the index is supposed to behave, but ecologists are used to thinking about species richness, which behaves differently. Thus, Jost points out in a 2010 paper that it is so very tempting to misinterpret these indices, especially at high levels of richness. So what’ s the solution? Convert to effective numbers! And now we arrive at values of Shannon diversity that behave like species richness: effective Shannon diversity of community 2 is now half that of community 1. This is because the index has been linearized! 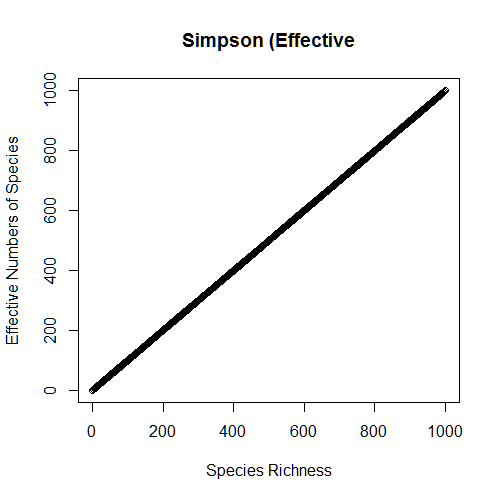 Let’s repeat this exercise with another popular index, Simpson diversity (or Gini-Simpson diversity). 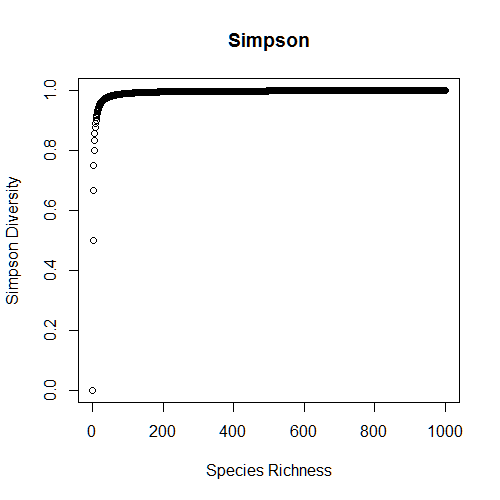 The output from the above code shows that Simpson diversity saturates at much lower levels of richness than Shannon diversity, which exacerbates the issue of misinterpretation. But once again, effective numbers transformation linearizes this index. Both Shannon and Simpson diversity are special cases entropy, which is the measure of disorder in a system (more disorder = more diversity). There is a general equation for entropy from which Shannon and Simpson diversity are derived. This equation has a parameter q that defines its sensitivity to rare species: low values of q favor rare species, high values of q favor abundant species. 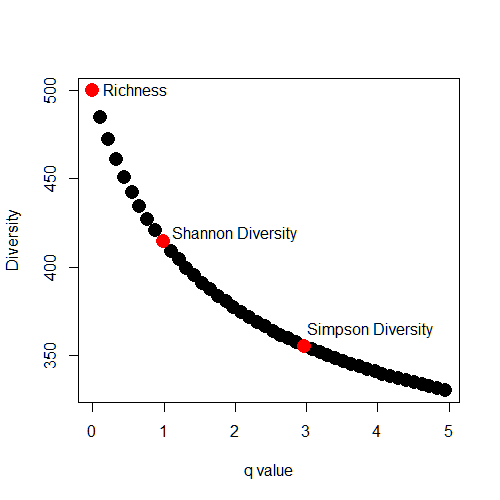 For example, Shannon diversity is of order q = 1, and for Simpson diversity q = 2. When q = 0, diversity = S (richness), because rare species are treated the same as abundant ones. One cool thing that can be done with this equation is that one can calculate diversity along a continuum of values of q to create what is called a ‘diversity profile’. A diversity profile allows you to judge the contributions of rare vs abundant species in a community. So let’s create a third community with 500 species whose abundances are randomly sampled from 1 to 1,000. The diversity profile for this community shows the values of richness, Shannon diversity, and Simpson diversity, and tells us what we already knew: there is strong dominance in this community. The full code (annotated, with another example) is available below. Jost, L. 2006. Entropy and diversity. Oikos 113(2): 363-375. Leinster, T. and C.A. Cobbold. 2012. Measuring diversity: the importance of species similarity. Ecology 93(3): 477-489. # And now diversity of community 2 is exactly half of the diversity of community 1! # This relationship is now linear! # YIKES! These values are nearly identical, yet we know community 2 is half as diverse as community 1! # Once again, effective numbers to the resuce! # Diversity drops off more steeply, since our community is dominated by a few very abundant species! Thank you! I’ve been lost in the literature about measuring diversity for a week. This provides some much needed clarity. Good day! I would like to ask if there is a macro or a calculator made specifically for converting Shannon’s index to effective number of species directly? Thank you for your soon reply! Hi – thank you for your post. Nice and informative. 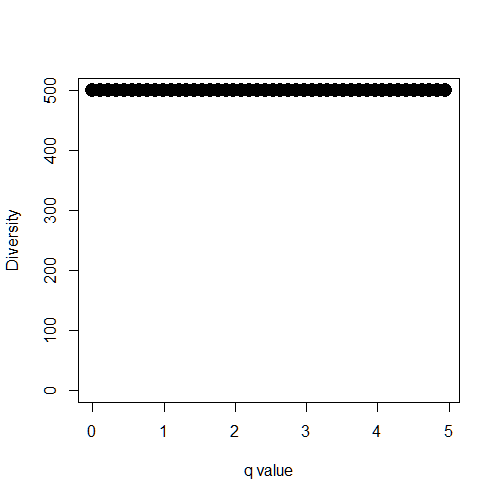 One remark – in the last figure with the diversity profile, you put the simpson index at q=3, but isn´t it usually at q=2 ?